On this broadly Augustinian view, “Nature” primarily refers to human nature, the way human beings are apart from Christ, and “Grace” is the way we can only live with supernatural help. In The Tree of Life, the mother is clearly associated with the way of Grace, and the father with the way of Nature, and here we see another aspect of the dualism: Law vs. Gospel. The father’s strict discipline based on seemingly arbitrary rules and an impulse toward an eye-for-an-eye suggests an Old Testament, pre-Christian vision of God, while the mother’s emphasis on love and forgiveness suggests a New Testament vision of God. But there is something odd about the way the viewer experiences this distinction in The Tree of Life. The movie – or at least the children through whose eyes we see the story – clearly preference the mother and the way of Grace. Yet it is far too simplistic to say that the mother is good and the father is bad. It is obvious that the father loves the children just as much as the mother does. And his disciplinarianism is motivated by his love: he is simply trying to prepare them to succeed in a world he sees as harsh and cruel. What’s more, the film recognizes that there is something good about the father’s strictness. When the father goes away for a business trip, the children run wild without any discipline. Likewise, the film doesn’t present the mother as always correct. It is hard to take seriously her suggestion that the sky is “where God lives”. She herself doesn’t entirely believe that God is this remote: when the priest comforts her for the death of her son by saying “He’s in God’s hands now”, she replies “He was in God’s hands the whole time”. In context, this is an accusation – how could God allow this – but it also shows an inconsistency in the mother’s thinking. She, like the mainstream Judeo-Christian tradition, tends both to think of God as transcendent – far away in heaven looking down – and also to think of God as immanent – present here with us at every moment where “all the world is shining” and “love is smiling through all things”. The odd thing is that the mother, following Thomas à Kempis, uses the word “Nature” for human fallenness. Yet for most of us “Nature” most readily suggests the non-human world, the world of trees and waterfalls and stars, the world The Tree of Life presents as so beautiful and full of wonder. Nature is where we most easily see God’s love smiling through, “Every leaf. Every ray of light”, as the mother says. So Nature would seem to be something good, something that points us toward the way of Grace. Yet the mother opposes Nature and Grace. It seems to me that one of Malick’s aims in The Tree of Life is to overcome these dualisms – not just Nature and Grace, but also Law vs. Gospel and Transcendence vs. Immanence: “Father. Mother. Always you wrestle inside me. Always you will.” The goal is to see God as both Father and Mother. The key scene for this interpretation is the sermon at the center of the film, the priest (referencing Job 1:21) says we must learn to see the Lord who gives as the same as the Lord who takes away. This line is from God’s speech to Job from the whirlwind, a mystical encounter with God that Job has after Job has, in essence, asked God why He allows (causes?) innocent people to suffer. God doesn’t directly answer Job’s question. Instead God gives a speech about the vastness, complexity, and terrifying beauty of the universe. God takes Job on the same journey the movie takes us on with its journey though the story of creation and the evolution of the dinosaurs. Part of the point of the God’s speech is that God is the creator of both the beautiful things and the horrible things in nature, the monsters like Behemoth (Job 40:15) and Leviathan (Job 41:1), represented by dinosaurs in The Tree of Life. The movie begins with the death of the main character’s brother. This is the event that Jack (played by Sean Penn as an adult) is trying to make sense of with his reflections on his childhood experiences. Jack and his mother can’t understand why God would take away their brother/son. But that is because they think of God as simply a God of love who smiles through the leaves. They can’t understand that the natural world is as violent as it is beautiful – the creation sequence ends when a meteor strikes the earth, killing the dinosaurs that were the high point of the evolutionary narrative. If God is willing to kill the dinosaurs which took billions of years of evolution to create, then why are we surprised that he is willing to kill a 19 year-old human child? The difficulty is learning to see the short life of the human being, the brief flowering of a sunflower that is born, spends its life turning toward the light, and soon withers and fades. Some of the flowers are destroyed by weather or animals or other natural mechanisms. But even the short life of these flowers is beautiful. And in fact the mechanisms that kill the flowers are themselves beautiful in a terrible way, like dinosaurs and meteors. There’s a line from the trailer, that I don’t remember seeing in the movie: “Someday we’ll fall down and weep, and we’ll understand it all. All things.” That’s what’s happening at the end of the film. The main character is coming to understand, to be reconciled to both his mother and his father, to see God shining through all things. The mother is right to insist on the way of Grace: “the only way to be happy is to love”. But she’s wrong to think that Grace is a matter of escaping Nature. Nature can be terrible in its indifference to human concerns, but nature is not selfish, and even in Nature’s awe-inspiring terribleness we can see God smiling through. “Nature” is not the right term for human fallenness. I’m not sure if Jack is supposed to be literally dead at the end and in heaven – I need to see the movie again – but he is certainly having a beatific vision, a mystical experience of the love and beauty of God. We see him embracing both his mother and his father, the beauty of Nature’s grace and the terror of Nature’s law. He’s having the same sort of experience that Job has when God speaks to him out of the whirlwind. This mystical experience could be just a symbolic near-death experience. Did you notice how the sound of the elevator beeping between floors sounds like an EKG? And if I recall correctly, Jack comes back down the elevator after having the vision, symbolically returning to life. 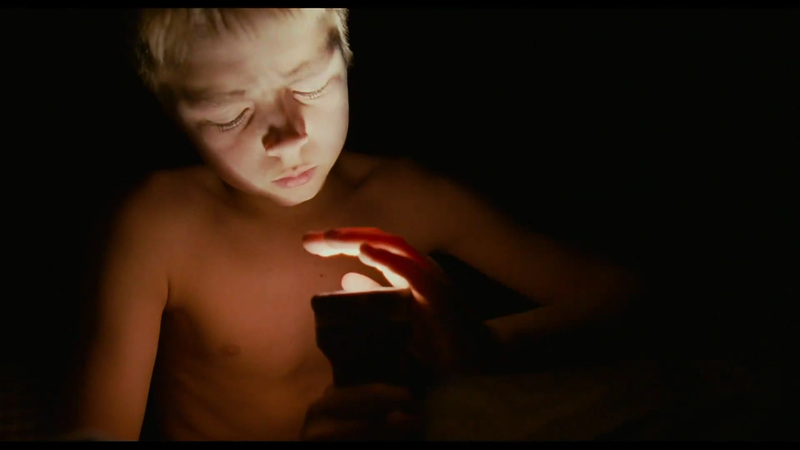 Either way, the mystical experience Jack has had is occasioned by his childhood memories and reflections on the origin of the universe – the movie we have just watched. Jack has glimpsed the big picture, the universe from God’s point of view. He has seen the terrible beauty of Nature. The goal is that we the viewers, having been inside Jack’s mind and therefore having experienced the same meditation as Jack will have the same mystical insight he gains at the end. We will be able to walk away from the movie believing that the God who gives is the same God who takes away. Nature, too, is supernatural Grace. Very good and helpful analysis. Thank you. I could not agree more, your analysis is very helpful. The movie on my part was indeed heart moving, warming yet mind boggling. Made me ask myself some questions and then answered them. The movie was LIFE, beautifully. Wow wow wow, thanks so much for helping me pull together everything i just saw . What are your interpretations to the use of architecture in the film? I thought I may have seen some reference to mans own creative potentials representing some innate divinity? The use of light and water were also prevelant two of the three things humans perceive to be crucial for life. And there were a lot of going through doors/choices/portals. I love the layered allegories in this film a very beautiful piece. Thank you for your insights. Oregano is a perennial herb which means it will come back year after year, and can get out of control if not properly contained. My friend, God really acts in misterious ways. I’m also thankful that Google exists or else I wouldn’t possibly find your blog (I just bookmark’d it). I watched Tree of Life multiple times and everytime I watch it again I feel like I am in a cathartic experience of understanding myself and all the beauty that surround us. Anyway, I loved your analysis of the movie and how well you pointed out the main discussions of movie. It is really inspiring to see that a few people took the time of writing about it. I do thank you for your time and I wish from the bottom of my heart a prosperous and ever long life for your and all of your family. Cheers from Brazil. Don’t want to be too critical as you have written many things that go some of the way to unravelling the complexity of the film. However, you don’t mention that, as a student, Malick made advanced studies of Heidegger, and this film is a magnificent melange of two things: first is Malick’s own experience of becoming sentient and growing up and the second is how that experience is illuminated by Heidegger’s concept of ‘dasein’ – that existence in the sentient sense is different from the existence of things and beings that are not aware of their existence. This is reflected in the scene where the predatory dinosaur ‘chooses’ to let the other one live. Yes, the film is intensely spiritual and ‘Christian’, but it also exquisitely delineates how the negative parts of our psyche are formed and how what we remember can illuminate our own personal philosophies. For example: the magnificent scene where JR, playing the guitar, ‘picks up’ the melody of the music being played by his father at the piano and young Jack witnesses this from the garden and feels excluded. Also – for example – the ‘preference for the mother’ is not exclusive, as in the extended sequence following the loss of the father’s job, young Jack acknowledges that ‘I am more like you than her’ – it is a scene that expresses the way that we learn to recognise our own faults. Finally, all of these things pale into insignificance when compared with the unimaginable complexity of the visual and aural expression that Malick has used in the film. Repeated imagery, matching speed of tracking shots, small snatches of music that are made redolent of other sequences by the way in which they are tied to the motion of characters… the density of expression goes on and on: deeper and deeper. This is why I am convinced that it is the greatest film made in my lifetime.